Whether you are aware of it or not, your daily life is full of demands. Most people are doing their best to balance their career and job-related responsibilities with the demands of their home and personal lives. Although technology has made it easier to manage and accomplish some of these tasks, it has also created an environment where we are always aware of our looming deadlines and responsibilities. Because of this, it is important to implement strategies that can help you be more productive and reduce stress throughout the day. Many people use coffee to help them get through their day, but how can coffee help you be more productive? 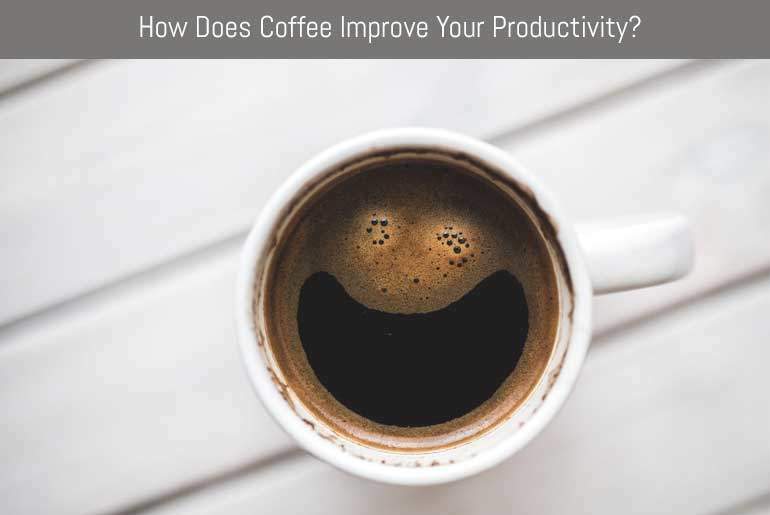 The answer is that coffee can have many effects on your brain that can help you focus and be more productive throughout the day. Coffee is a popular drink produced and consumed all over the world in many different countries and cultures. The two major types of beans are known as Arabica beans and Robusta beans. Usually, Arabica beans are a higher quality compared to Robusta beans. Arabica beans are typically more flavorful but a significant portion of coffee’s taste is due to the degree of roasting. When a bean is roasted longer, is becomes darker in nature and is commonly referred to as a dark roast. Coffee is widely popular because it has several benefits that can ultimately improve your productivity. A major reason most people choose to drink coffee in the morning is because it wakes them up and can improve their mood. This is important because how you feel can greatly impact your productivity. Our emotions, both positive and negative, will influence our ability to focus and get things accomplished. If you are upset, sad, or angry, it may be difficult to find the motivation or energy needed to accomplish a task. Coffee can also improve your memory. Having a sharper memory can help you with your work and it can help make sure you don’t forget anything you need to accomplish during the day. Coffee can also improve your productivity by boosting your energy and making you feel less tired. Coffee can act in the brain to block biochemical signals that make you feel tired and sleepy. This can help you get a jump start to the day, or provide the energy you need to help you stay awake if you have a late night of work ahead. Since coffee can improve your mood, boost your energy and make you feel less tired, it is a great tool for your productivity. However, it is important to note that not all coffee is the same. Lighter roasts tend to have more caffeine compared to darker roasts. Since caffeine is the substance responsible for the majority of coffee’s effects, you should choose your coffee and roast in order to obtain both the desired amount of caffeine and taste required to maximize your productivity. Prioritizing your health and feeling like the best version of yourself can also help to maximize your productivity. Coffee can be an excellent way to improve your productivity, but when it is consumed in excess amounts it may lead to harmful effects that may impair your productivity. It can cause insomnia, make you feel tired and sluggish, and can cause gastrointestinal issues. It is also important that you eat a balanced diet and get plenty of exercise. This will bolster your overall health and will help you feel better. Sleep is also an integral component to maximizing your productivity. If you are having trouble sleeping because you have a lot on your mind or you are preparing for a big day, you might want to try sleep meditation, or relaxing practices that can help clear your mind and relax. Beyond coffee and feeling healthy, there are a few simple things you can do each day to maximize your productivity. Try prioritizing your day and tasks. When you have an idea of what is more important you can begin checking off everything on your list. Also, schedule and track your time. If you only have an hour to dedicate to a certain task, stick to it and don’t let it spill into time designated for other things. Coffee can help you manage this because you can use coffee to separate and transition to the next task. This will also give you the boost of energy you need to tackle the next item on your list. Due to our busy lifestyles, discovering helpful strategies to help us manage our busy schedules will allow us to be successful in our work or professional life. These same strategies can be implemented in our personal lives to help us accomplish all our lives demands. Coffee is a simple way to help improve your productivity and can ultimately help us lead a more happy, healthy and productive life. So, the next time you are feeling a bit overwhelmed with all of life’s responsibilities, why not let a cup of coffee help you share the workload? Sarah writes for We Dream of Coffee. She is a connoisseur at heart, but she also wants to teach people everything she’s learned and how people can benefit from her favorite drink.